It’s not uncommon for RMHCA guest families to meet and realize they’re from the same area of Alabama. 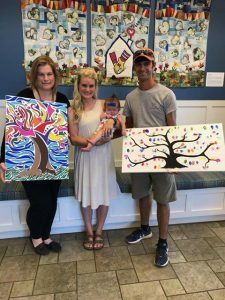 Sometimes, they might even have known of each other before coming to stay at the Ronald McDonald House, as is the case with the Bond and Vandiver families. Even more amazing is how the Colbert County community has rallied for their neighbors and the charity at large. Two years ago, the students at Colbert County High School (CCHS) began collecting pop tabs for RMHCA. They were inspired in part by their school store manager, Bridget Bond. Her son, Cody, and daughter-in-law, Ashton, have stayed at the Ronald McDonald House twice. The first stay was for 15 days when their daughter Hadlee Clayre was born early and then again for 67 days when their second daughter HagenKate also made her appearance into this world as a micro-preemie. While Bridget was inspiring her students, Ashton and Cody themselves were kind enough to make several Wish List donations, knowing how important it is for the House to always feel like a home. Ashton, HagenKate and Cody Bond show off the paintings created by a CCHS student. “To express how thankful we are for the RMHCA is almost impossible. With HagenKate being the second premature child we have had, you can imagine how much it has meant to know we had a “home” for the time we would spend at UAB,” Ashton says. 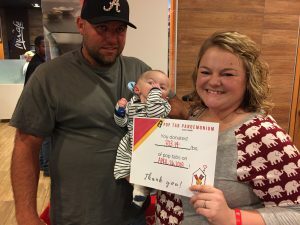 But the Bonds weren’t the only Colbert County family who needed the Ronald McDonald House. Justin and Megan Vandiver’s son, Kane, was born last fall and he needed to stay in the NICU for 69 days so doctors could treat him for hydrocephalus and also so he could learn how to eat. Hydrocephalus happens when the brain doesn’t drain cerebrospinal fluid the way it should and doctors step in to help. Justin, Kane and Megan Vandiver at the Tuscumbia Pop Tab Party. “We thought if we could put a face from the community with the cause, it would mean more to those who donated,” Bridget tells us. When the drive came to a close, the CCHS students collected a whopping 303 pounds of pop tabs! When the CCHS students dropped off those tabs at the Tuscumbia Pop Tab Party, they brought a special surprise. CCHS junior Emily Spice painted two special pieces to hang in the Ronald McDonald House in honor of Kane and HagenKate. One of the paintings is a thumb print tree, and the “leaves” were made by the Leighton Elementary 4th grade classes. One of those fourth graders is Kane’s big sister, Abby! 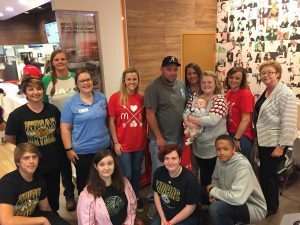 CCHS students, Bridget Bond, the Vandiver family, RMHCA staff and McDonald’s Owner Operator Debbie Martin and her business partner Rebecca Rippey at the Tuscumbia Pop Tab Party. RMHCA is so grateful to the Bonds, Vandivers and the Colbert County community for giving back. We’d also like to thank the Colbert County FFA Alumni organization for donating a portion of their silent auction proceeds to us this year. If you’re feeling inspired to give back to, consider making a donation or volunteering! 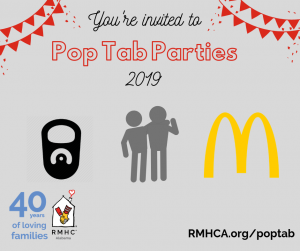 If you’re a teacher or student who’s interested in participating in our Pop Tab Pandemonium school contest, learn more here!